Settle Hydro: Re-using our Industrial Heritage! Bridge End Mill is probably a very old site for water power. There may have been a mill here for 'fulling' woollen cloth in the sixteenth century. A forge, possible using water-powered tilt hammers to smelt iron, is recorded on the site of the mill in 1774. The present buildings, which seem to have been re-built at least twice, probably date from around 1790. A small firm of cotton spinners called 'Wilkinson, Buck and Jay' is believed to have started water-powered cotton spinning here some time around 1785. 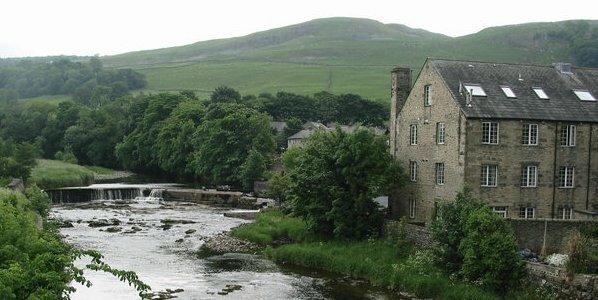 In 1802 the mill was owned by 'Edmund Armistead' who described himself as a 'Cotton Merchant and Proprietor of a Cotton Mill at Settle Bridge'. A rough sketch of Settle looking from Giggleswick in 1816 by J M W Turner shows Settle Bridge in the foreground and, a little upstream, Bridge End Mill. 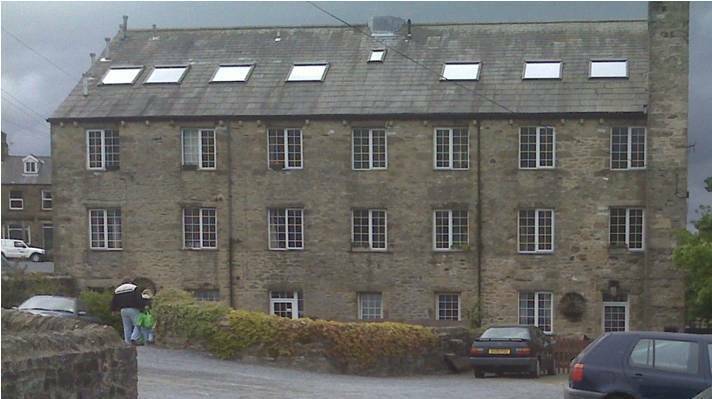 Although the Mill is depicted merely by a few pencil marks, windows can be seen on three floors on the gable facing the river and there are windows on at least two floors along the south side of the mill. Interestingly, Turner depicts five windows along the side of the mill, whereas today there are seven, so perhaps the mill was a little shorter then. Turner's sketch is very useful because it may well depict the mill shortly before a major re-building in 1818. For that is the date in the keystone of the arch supporting the outer wall of the present mill, above the water course just below the water-wheel. The initials W.C. on the dated keystone are probably those of William Clayton, the major partner in a large cotton mill about a mile upstream at Langcliffe Place. Bridge End Mill was certainly owned by the Clayton family in 1849 because it is included in their bankruptcy sale of property. The sale catalogue of Clayton's property in 1849 also contains details of the machinery in Bridge End Mill. The list includes spinning machines called mules which were operated by skilled male spinners. The 'spinning mule' replaced earlier spinning machines operated by women around 1820. The installation of 'spinning mules' may have prompted the re-building of Bridge End Mill in 1818 as well as the construction of the cottages between the mill and the bridge. It may have been necessary to provide housing for the skilled male operatives who worked the 'spinning mules'. 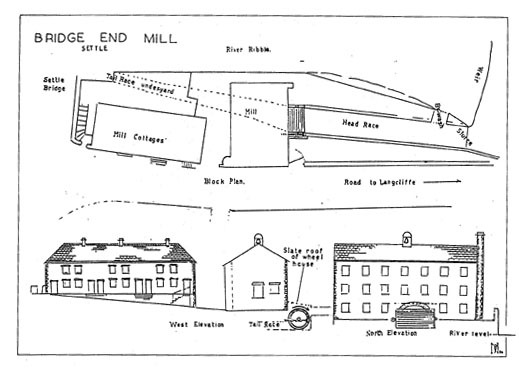 In 1861 Bridge End Mill was purchased by Hector Christie and Co. and subsequently fitted out as a joiner's workshop using water-powered machinery. The joiners, Brassington and Co., who ran the mill, apparently came to Settle with Hector Christie from Derbyshire. It is possible that the water-wheel dates from the refitting of the mill as a joiner's workshop in the 1860's. For the greater part of the year, water supply was adequate to power the machinery, but in a dry summer extra water was directed into the head race by raising the weir crest with boards. Work produced in the joiner's shop is admired to this day by the many visitors to churches of the district including Giggleswick School Chapel. Much of the church furniture was made from imported cedar, cut by a horizontal saw powered by water. 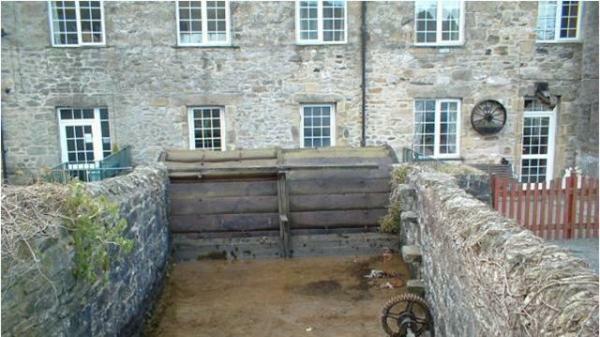 The water-wheel at Bridge End Mill is the only surviving water-wheel in Upper Ribblesdale. It is a fine monument, illustrating an important source of power in the Dales. The mill is now a block of flats but the wheel is still there and can be turned by water.